Here is the basic circuit for the motor controller. As you can see, I have salvaged an old PS2 keyboard's IO board, connecting the negative pins of the LED's to the 4069's inverter inputs. This is because the LEDs turn on when their negative leg is pulled to ground by the keyboard controller. 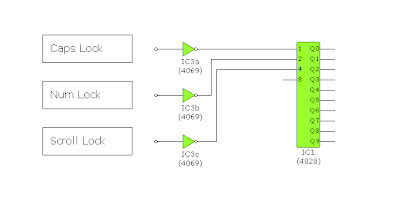 The output of inverters goes to the inputs of a BCD-Decimal IC. This converts the binary number held in the LED's states to a discrete high-pin on the 4028's output. This will give me the 6 discrete control states for the motor controller described before, as well as "all off" and an auxiliary. In my 75% complete application, the Caps Lock LED controls the left motor, and the Num Lock LED controls the right motor. The reason that I used the Caps/Num/Scroll Lock LED's is that the Robot will not need text input whilst driving. I used a clunky old PS2 interface as the Microclient Jr only has 3 USB ports, and I did not want the power-hog of a USB Hub if I needed more that 2 extra peripherals.